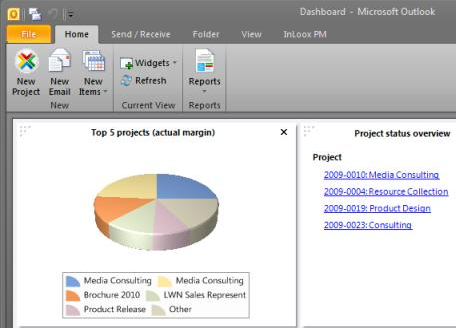 In Outlook 2003/2007, click InLoox PM Folder in the InLoox PM Toolbar and then Dashboard in the InLoox PM project list. Choose the widgets that you want from the drop-down list, e.g. Project status overview or Top 5 projects (actual margin). For details on the different widgets, please see Widget types. For more information about reports see the category Reports. Double-click on the entry in the widget list to open the corresponding project. How to create and edit custom dashboards in InLoox PM 7 • Copyright 1999-2019 © InLoox, Inc. All rights reserved.